“I am a writer,” said Logan, an eight year-old boy in my wife’s class. On the surface, this is a simple statement from a cute third grader, but when read in the context of his journey as a student, it is remarkable. Just three months earlier during writing time, he had sat motionless day after day staring at a blank page, pencil in hand with apparently nothing to say. My wife, Leslie, observed him and was somewhat perplexed. He enjoyed reading and was articulate in class discussions, but when it came to writing, he drew a blank. Boy, do I know the feeling. As a high school student, I too, sat motionless staring at blank pages. It wasn’t that I had nothing to say or didn’t know how to express myself verbally, in fact quite the opposite. I have several keepsakes safely stored in my attic that serve as mileposts in my own academic journey. There’s a stack of my elementary report cards, filled with teacher comments like, “Curt talks too much” or “Curt is always doodling” (now a badge of honor for this consultant/graphic designer). Then there’s the solitary essay from my junior year. In bright red pen at the top of the page, my favorite English teacher and mentor, Mr. Johansen, scrawled a bold letter “D” followed by these poignant words: “Great writing! It would’ve been an ‘A’ if you had turned it in on time.” Those words impacted me more than anything he ever taught in class. It wasn’t until years later, when personal computers became accessible to the average person, that I discovered the real reason for my writing block. I was a perfectionist. With a keyboard in hand and the ability to quickly type my thoughts and instantly edit without having to scratch out my mistakes, a whole new world opened up to me. I was no longer bogged down by the mechanics of writing by hand. I actually began to enjoy it. Today, as a graphic designer and educational consultant, I use my writing and editing skills on a daily basis and I love it. 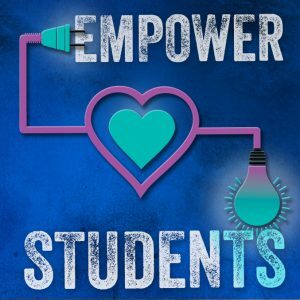 So, what’s the secret to empowering students? How can we unleash their hidden potential? While I’m not sure I’m qualified to answer this question fully, I have gleaned a few important strategies from working at Inflexion and living with a veteran teacher who is really skilled at tapping into students’ strengths. With all of the pressure on test results in education, the focus can quickly become centered on content memorization. It’s one thing to be able to regurgitate facts on a test, but another altogether to truly understand the topic at hand. Knowing how to read and identifying yourself as “a reader” are two very different things. I’ve seen time and time again that when educators take the time to know their students the relationship shifts for both of them. Learning and instruction becomes personal, and teachers can help students connect what they learn with who they are. When I think of the teachers who had the greatest impact on my desire to learn, I don’t think of those who had really nifty tricks for memorizing periodic tables or grammar rules. I think of those who took the time to really know me. They were no longer just instructors, but became mentors. And I’d like to think I became more than just another line in a gradebook to them. When students know teachers care about them as a person, they drop their guard and are more likely to take ownership of their learning and start to view themselves as lifelong learners. Leslie always spends the first few weeks of school each year prioritizing community building with her class. She works hard to help her students get to know each other, discover who they are as a group, and develop a caring classroom culture, despite the intense pressure to dive right into the curriculum and start checking off standards. Although they may not move forward on the state standards during these first few weeks, they improve critical skills toward becoming life ready. Over time, she has discovered that this emphasis translates to a greater depth of learning and collaboration as the year goes on. Because she establishes a “we’re in this together” culture, behavior issues rarely arise, and when they do, it becomes a project for the students to solve together. I’m amazed every time I visit her class and see how this plays out. I’ve witnessed a child venting frustration suddenly become surrounded by three students offering to help walk them through a solution. I’ve watched a student ask Leslie for help, and her response is to ask the classroom, “Who is a specialist in Google Docs who can help Sierra?” Specialists’ hands shoot up around the room. Sierra chooses one to help her while everyone else goes back to their independent or collaborative work. This kind of community culture doesn’t happen naturally, it has to be cultivated and reinforced daily, but the inspiring results make it worth the investment of time. Personally, much of my work with schools revolves around building cultural identity. Our team has discovered that when schools have a clear vision of who they are and what they value, they become invested in each other’s growth. Shared values, that we call “maxims,” become the filter for every action and decision made by the learning community. When staff and students share a commitment to community values, discipline becomes focused on restoration in the community, curriculum becomes a tool to reinforce the maxims, teachers and students become collaborators, and students take ownership of their learning. This reminds me of when I was a college student in California. I spent a lot of time (and I mean a LOT of time) boogie boarding and body surfing at Huntington Beach. I would swim out to the biggest waves and wait for just the right one to come along. I paid close attention to the swells and when one arrived that I felt would break just right, I swam as hard as I could hoping to catch it. Sometimes they passed me by, but other times I would catch it perfectly. There was nothing like the feeling of being lifted up and then propelled down the face of a huge wave, riding it for all it was worth. Effective teachers do the same thing with their students. They observe closely, waiting for just the right moment to lift them up and propel them forward. Then they ride the wave for all it’s worth. Rather than focusing on the waves they didn’t catch, they jump up and down in celebration when they ride one all the way into shore. This is what Mr. Johansen did for me and what Leslie tries to do for students like Logan. So, how did Logan go from staring at blank pages to self identifying as a writer? He discovered one day that the Chromebook he was using had a voice-to-text feature. He brought it to Leslie and said, “Is it okay if I use this to write my story?” Instead of saying “No. That doesn’t line up with the third grade standards.” she said, “Wow! That’s really cool. Of course you can do that! Let me know how it goes.” He excitedly went back to his seat and created an amazing story by speaking it into text and then editing. Leslie then “rode the wave” by getting his permission to read part of the story to the class. After reading the selection, she asked the class, “Wasn’t that a great beginning? Aren’t you all on the edge of your seats? Don’t you all wonder what happens next?” The class was enthusiastic and Logan was bursting with pride. Soon, he became the class voice-to-text specialist and within days finished a book that was so well received by his classmates that they cheered when he shared it and are clamoring for a second book. When Leslie tells this story, she downplays her role because she was just doing her job. But in reality, she built a relationship with him, created a community that celebrates victories together through shared values, and highlighted things that he was already doing well. And now… Logan is a writer.